Published by jalbertini on September 24th, 2018 in Hawaii Independence, Military, Pohakuloa, Social Justice, Take Action!. I am against the Programmatic Agreement until further consultation with Native Hawaiians occurs and a more collaborative effort to examine the concerns in question (below) are addressed. How does each training activity impact archaeological resources that are known? If only 45% of the known resources have been discovered, and 55% of the areas being used have not even been surveyed, what is the timeline for surveying so that we know what other impacts are occurring? What are the adverse effects caused by continued use of the live-fire ranges, including the targeted high-hazard impact area? What are the adverse effects associated with investigation and disposal of unexploded ordnances? What type of adverse effects could result from emergency situations, including but not limited to, emergencies declared by the President or the Governor of Hawaii or actions to protect human health and property? How many archaeological sites will be adversely impacted by training activities within the “Go” areas and each training, high impact and maneuver areas? Stipulation I.A. of the PA states: “To the extent feasible, USAG-Pōhakuloa and RDH shall develop and authorize undertakings designed to avoid adverse effects to historic properties.” The PA authorizes USAG-Pōhakuloa and RDH as the only individuals who will provide “mitigation” measures. Every “mitigation” measure should be formed in consultation with Native Hawaiian organizations and individuals who attach religious and cultural significance to historic properties that may be affected by an undertaking. The PA should be revised to ensure we the consultants and other NHOs are consulted regarding these “mitigation” measures. There is a reason why I emphasize the word mitigation. The word mitigation means to reduce the severity, seriousness, or painfulness of something. It often feels like the military and the government agencies do not really seek to mitigate adverse effects to historic properties because the severity, seriousness and painfulness of the their destructive actions have not been reduced, but rather, it has increased in depth and breadth. As a kanaka, Iʻd like to see real solutions and real collaboration to identify what archaeological sites and resources we have, what they mean for us as a people, and whether we are still willing to participate in a legacy of desecration and erasure of these sites and resources. I am certainly not willing to do so. Why we continue to wage war when our world needs us, more than ever, to wage peace, is an issue that we MUST address at all levels of society, all levels of government, and most certainly at all levels of humanity. We cannot continue to destroy the earth and its inhabitants without recognizing humanityʻs role in the consequences. 1.The Defendants breached their trust obligations by failing to mālama ʻāina the Subject Lands [State General Lease No. S-3849], 2. The Defendants are ordered to fulfill their trust obligations by doing the following: A. Defendants shall promptly initiate and undertake affirmative activity to mālama ‘āina the Subject Lands. B. Mālama ‘āina of the Subject Lands by Defendants includes, but is not necessarily limited to 1. 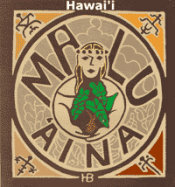 To develop a written plan to mālama ʻāina the Subject Lands. I would add, AND ACT ON THAT PLAN TO MĀLAMA ʻĀINA. Please make sure that the Defendants fulfill their trust obligations. Make good on the court findings. Iʻd like to see the military stop all live bombing of our land and waters. Iʻd like to see the military clean up Kahoʻolawe like they said they would. Iʻd like to see the military clean up Makua Valley, Waikoloa, Pohakuloa, and Red Hill. There needs to be greater accountability in regards to environmental and cultural issues. Be pono.